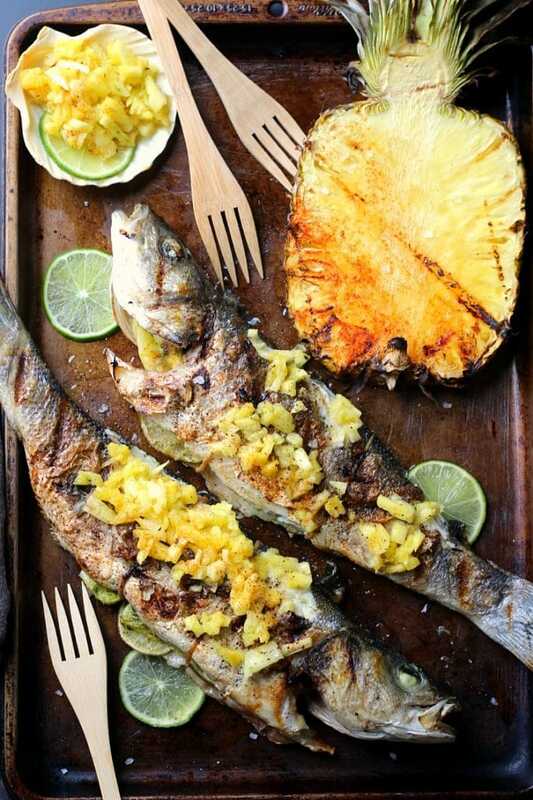 Give your family and friends a Tropical Island experience with this Grilled Branzino stuffed with pineapple and lime, generously seasoned with paprika and coarse sea salt to complement it’s flavors. Truth be told, there are few dishes more fascinating then grilled whole fish. For me, it’s a reminder of my childhood years eating peixe frito by the beach. In Brazil it’s very common to serve whole fish with farofa (toasted cassava flour mixture), especially in cities near the coast. If you never ate a whole fish, preferably grilled -you are in for a treat! I like branzino or black bass to cook whole because of the size (it’s manageable to flip and stuff) and their skin crisp up beautifully. 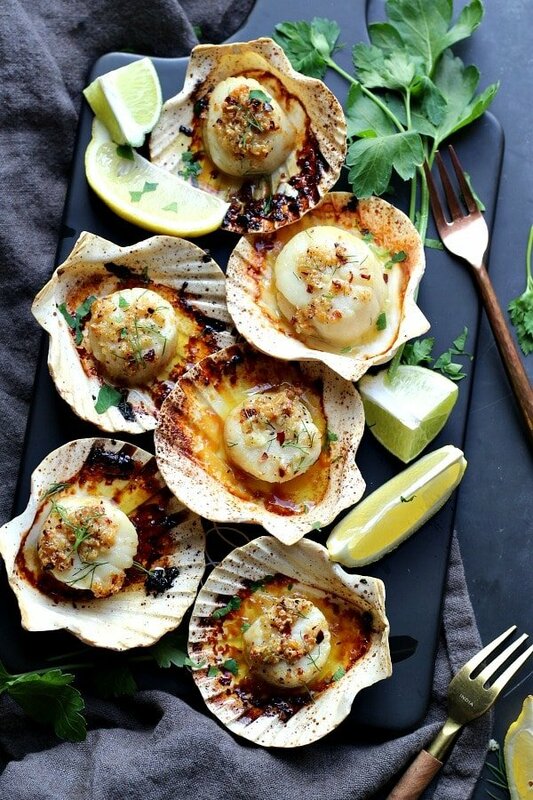 Cook more fish on the grill! Please don’t be intimidated by it -for no reason is good enough reason. Fish is super easy to grill, and if anything you are more likely to get that steak done wrong! and finally, buy your fish from a reputable store or fish market where you know the catch is coming in and going out, and not just sitting there. Hopefully this will give you some answers and get you excited to cook a whole fish for the first time, but if you have done it before, I think you will love this easy recipe packed in flavor. 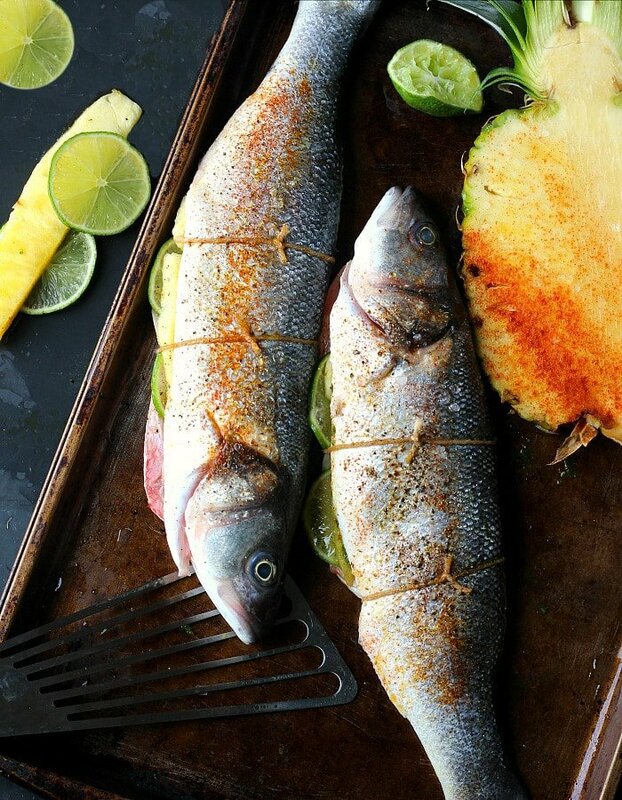 Give your family and friends a tropical island experience with this Grilled Branzino stuffed with pineapple and lime, generously seasoned with paprika and coarse sea salt to complement it’s flavors. Serve with this Garlicky Brown Rice for a complete meal that no one will resist! Pre-heat grill to 400F degrees. Take a half pineapple (be sure it’s cut length wise) and cut the end off, leaving you with a 1½ inch piece of pineapple, crown included. With the end piece, you remove the thick skin and chop into small chunks. Season wth a tiny pinch of paprika and juice from ½ lime. Set aside. 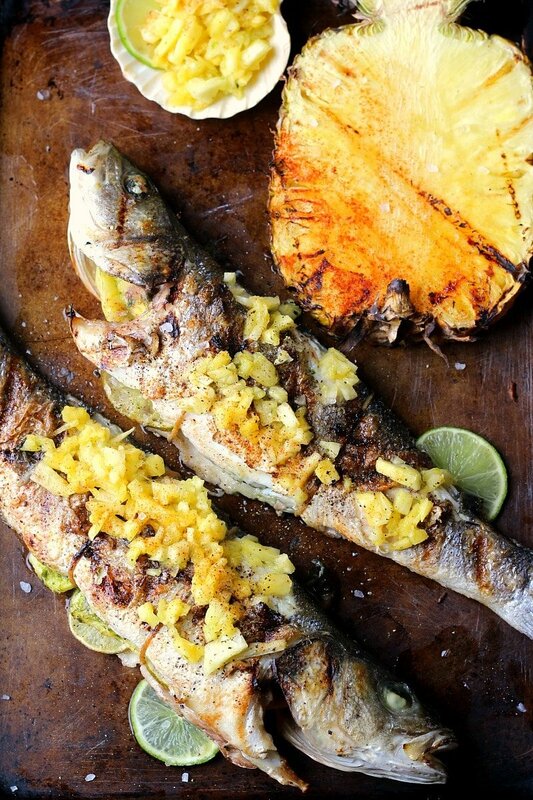 The whole thick slice of pineapple can be seasoned as well and grilled for at the same time as the fish. Thoroughly wash and clean the fish. Season the fish cavities with salt and pepper then stuff each cavity with lime slices and pineapple chunks. Rub the outside of the fish with the olive oil and season with salt, pepper and paprika. Tight a piece of kitchen twine on two spots on each fish to hold stuffing in place. Grill the branzino turning once, until browned and crisp and just cooked through, about 7 minutes per side. The pineapple slice will be grill at the same time. 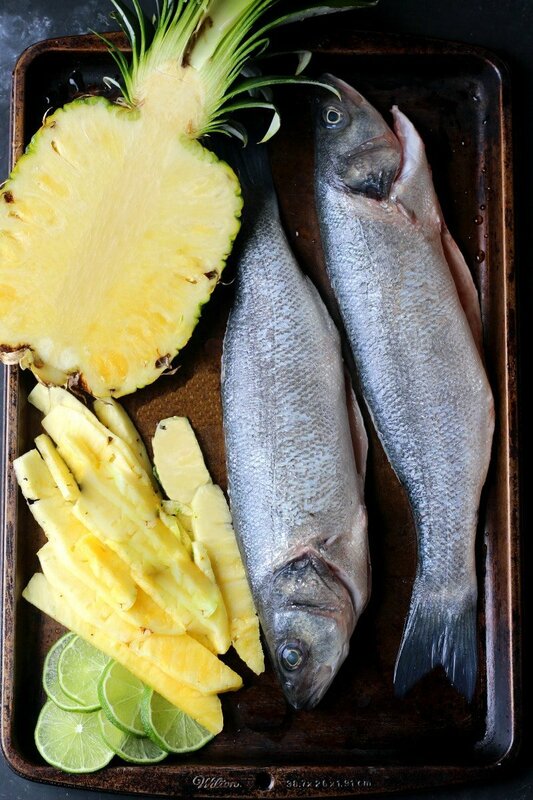 Serve the grilled branzino with pineapple chucks, fresh lime slices and coarse sea salt.